The winds are picking up and finally we have some proper wet weather here in southern England. It’s been cold too, with night temperatures consistantly dropping below zero last week, and some hard frost reaching up into the tree branches. Now is the ideal time to start planning your sweet pea garden for next year, and getting some seeds sown. Many growers sow in November indoors, overwintering the young plants in a cold frame or unheated greenhouse. This gives the plants a good strong vegetative start before floral initiation, and the chance to develop vigorous roots. This is also the later end of the window for sowing Winter Sunshine varieties, which initiate flowering as early as late March, and need as much time over the winter as possible to get going. With the Spencer varieties, I also get a fantastic crop from a late January sowing, with flowers typically from July onwards, and sweet peas can still get a good start from sowings well into March. At last the seed harvest is making it’s way into packets and out into the world! I’m delighted that the beautiful blue varieties ‘Bristol’ and ‘Oban Bay’ are now available again. Bristol is a soft powder blue and Oban Bay a paler, ice blue shade. Both are deliciously fragrant and have a excellent track record on the exhibition bench. Find out more and purchase seed in the product pages. My sweet peas have decided to put in a second flowering this year, so I am enjoying an abundance of fragrant blooms as I harvest the many seed pods that are also adorning my plants. I was recently given a beautiful hand made silk dress that makes me feel quite like a sweet pea when I wear it - so here is a photo of me communing with the refined lightness and elegance of these flowers. In the posy are Oban Bay, Mollie Rilstone and a few Limelight. We've seen very little rain here in the UK over the past couple of months and the sun has been cracking the earth, drying and scorching the grass lands. Many flowering plants seem to nonetheless be thriving, and my Devonshire sweet peas are no exception - I have barely given them any extra water in recent weeks and they are putting on a gorgeous show. My Sweet Peas started flowering here in South Devon nearly two weeks ago! I've cut back most of the flowers in the hope that the plants will generate a bit more vegetative vigour before putting on thir full floral display through July and August. The heirlooms varieties in particular have been very eager to flower - 'Wretham Pink' and 'Cupani' in particular have been beautiful (a mix of 'Cupani' and 'Matucana' are shown in the foreground here). Mark Rowland and Maggie Goodsell are the originators of Owl's Acre Seed, previously Owl's Acre Sweet Peas. 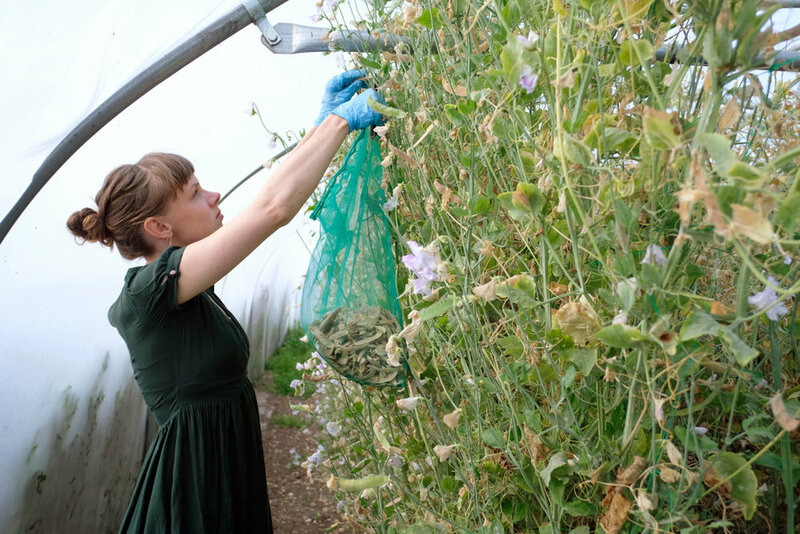 I am grateful for our continuing business connections and their ongoing support and advice, gleened over many dedicated years of working with Sweet Peas. I have recently listed a range of chilli seed in the shop that has been bred and selected by Mark and Maggie's company, 'Gourmet Genetics', and we are offering some tomato varieties from them too. I've been meaning to put the chillies online for a while, and am really happy to now have ten of Gourmet Genetics selections available. Mark's significant chilli program has involved trialling chillies from all over the world, to find those most suited to growing in the Northern European climate. His focus has been on determining those varieties with the most outstanding flavour. The chillies now available from Owl's Acre comprise three different cultivated species: Capsicum anuum, Capsicum baccatum and Capsicum chinense, as well as 'Lancer', a cross between C. anuum and C. frutescens. All the species originate in Central and South America, and comprise fruits with a wide varieties of flavours, colours and forms: from sweet bell peppers (C. anuum) to fruity, mild chillies (C. baccatum) and the more fiercely hot and pungent varieties (C. chinense and C. anuum). All the varieties on offer here are suitable for Northern European cultivation, where they generally perform as annuals (though most are technically perennial in their native climates). Ideally chilli seed should be sown mid-February, and kept at a temperature of around 24 degrees or warmer for germination. They can then be kept slightly cooler, between 20 and 24 degrees, with plenty of light. As the plants become established the temperature can gradually be decreased. They can be grown in pots or in the soil.